Oregon school board members took pressing education issues directly to the state’s congressional delegation Tuesday. Nearly two dozen Oregon school board members and OSBA staff traveled to Washington, D.C., for the National School Boards Association’s 2019 Advocacy Institute. 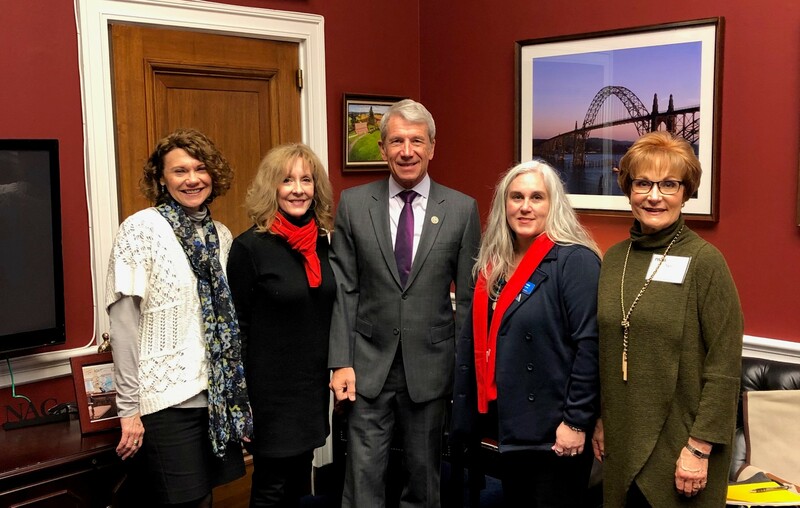 Four days of symposiums, advocacy training events and networking with hundreds of school board members from around the country culminated with personal meetings with Oregon’s seven congressional members. OSBA Board President Tass Morrison (North Santiam SD) said Oregon school board members focused on reauthorizing and updating the Individuals with Disabilities Education Act, which helps fund special education costs, and the Secure Rural Schools and Community Self-Determination Act, which provides school funding to replace lost timber revenue. The Oregon contingent included OSBA Board, Legislative Policy Committee, Oregon School Board Members of Color Caucus and staff members. The Oregon contingent included OSBA Board, Legislative Policy Committee, Oregon School Board Members of Color Caucus and staff members. Attendees in addition to Morrison included OSBA President-elect Kevin Cassidy (Baker SD); Vice President Scott Rogers (Athena-Weston SD); Secretary-Treasurer Maureen Wolf (Tigard-Tualatin SD); Past President LeeAnn Larsen (Beaverton SD); Paul Anthony (Portland PS); Andrew Bryan (Baker SD); Loren Chavarría (Corvallis SD); Yesenia Delgado (Reynolds SD); Sherry Duerst-Higgins (South Lane SD and Lane ESD); Kris Howatt (Gresham-Barlow SD); Melissa LaCrosse (Jefferson SD); Sonja McKenzie (Parkrose SD); Rita Moore (Portland PS); Betty Reynolds (West Linn-Wilsonville SD); Ricardo Ruiz (Reynolds SD); Jennifer Spurgeon (Athena-Weston SD); and Kim Strelchun (Hillsboro SD). Board members asked legislators how they could do more to support legislation to help students and schools. “They said we could send them data, but what they really wanted were our stories, what’s working, what’s not working,” Morrison said. OSBA’s Oregonians for Student Success campaign is providing education advocacy support, as well as creating town halls and lobby days to help school board members connect with state legislators to make the case for adequate and stable school funding.